The sauna, in its most original form, is a small room with some water thrown on to hot rocks. It has existed in northern Europe long before recorded history. 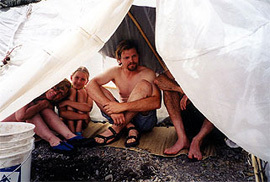 The nomads of what later became Scandinavia probably used a portable sauna similar to those seen among modern nomadic tribes of central Asia. They dug a pit in the ground and built a fire outside of the pit. 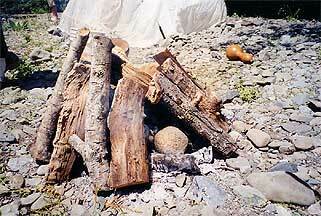 Rocks were placed into the blazing firewood. 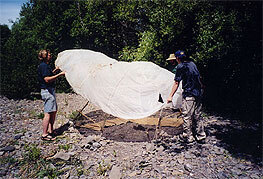 The hot rocks were then tossed into the center of the pit, the bathers gathered around the heated stones, and a tarp enclosed the bathers and the pit to create a warm place for steam bathing. Water was poured onto the rocks to produce steam. The bath ended with a plunge into cold water or, for the hardy, into snow. The primitive sauna evolved into the smoke sauna or "savusauna". It was a small shed with a massive fireplace and no chimney. After the fire had died, the smoke was released through a small hatch on the wall. The benches were then scrubbed due to the soot from the smoke.The fireplace radiated plenty of heat for many hours. Smoke saunas are almost non-existent these days, as they tend to burn down easily. The few surviving smoke saunas that I have seen have been converted to stove type saunas. 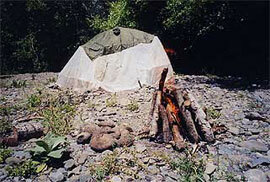 The early European sauna was somewhat similar to the Native American sweat lodge. Other cultures have had their own version: the Russian bania, the Turkish hamam, and the Swedish badstuga. During the Middle Ages sweat bathing was popular in many parts of Europe. However, the church forced the demise of sweat bathing in most of Europe. They were not successful in forcing the stubborn Finns to give up their saunas. The Finns used their saunas for more than mere bathing. The sauna was a warm, germ-free place with plenty of water. The savusauna's smoke contained tannic acid that sterilized the bench surfaces. The old Finnish proverb, "Sauna on köyhän apteekk", says "The sauna is the poor man's pharmacy". Minor medical procedures were carried out there. The sauna was where children were born. In my hometown in northern Minnesota there are a few old timers who boast of being born in the sauna. Women went through a purification ritual before marriage in the sauna. Old folks often dragged themselves into the sauna to die. It was common for neighbors to take turns preparing the saunas. In the old days, when the sauna was hot, there would be a knock on the neighbors' doors and the shout, "The sauna is ready!" Today the same thing happens in northern Minnesota, albeit with a phone call. I have been fortunate to have the sauna tradition as a part of my life. My father built a luxury sauna on our farm in northern Minnesota. It came complete with electric lights, dressing room, wood stove, hot and cold running water. My hunting buddies built a small sauna at our deer camp. No running water, but some snow tossed onto the hot rocks worked quite well. Before it was built, the guys would leave the camp after a few days just so they could get clean. After it was built, they would stay for a week or more. An old Finnish folk tale told of a farmer who enjoyed the sauna heat so much the Devil made a trip to meet him "I hear you like the heat of a sauna," said the Devil. "I do." replied the farmer. So, the Devil invited him to a place where it is so hot that "you'll be begging me to stop it." Hearing this, the farmer went willingly. When they arrived in Hell, the Devil shouted to his demons to throw more coal on the fire. "More heat!" yelled the Devil. "We have a farmer here who loves the heat." Soon Hell was blazing with fire. It was so hot on earth that volcanoes began to erupt. The farmer smiled. "More heat!" the Devil yelled. "More heat for this dumb farmer!" By this time all the residents of Hell had gathered to watch. Then they began to chant. "Heat, heat, heat!" The Devil was mighty embarrassed; for Hell was Heaven for the farmer. The farmer smiled again, and thanked him for such a wonderful heat. Finally the exasperated devil screamed, "Get out! I never want to see you down here again." So, the farmer returned to Finland, sad to lose the wonderful heat, but knowing his fate was secure. For the last few years, we have been setting up a primitive sauna on the banks of the creek at the annual Rattlesnake Rendezvous. It is usually one of the final activities at the end of the weekend. 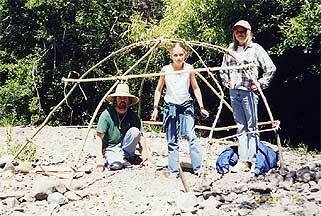 The frame is a simple structure of willow saplings, using the sapling's stripped off bark to tie the frame together. 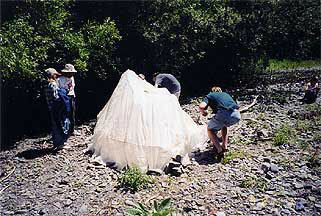 The structure is then covered with whatever we have available, in our case, a couple of tarps and a parachute. Inside we have some grass mats, a wooden bowel, a ladle, some willow switches, and a small pit in the middle. A fire is built outside. Rocks are put into the fire and more firewood is added.When the stones are hot, the bathers get into the bathhouse, and the hot rocks are moved into the center pit. The door flap is closed and water is sprinkled onto the glowing, hot rocks. The steam that is produced will fill the sauna. When the stones have cooled and no longer produce steam, the door flap is opened and a quick dowsing in the water finishes the bath. "After a sauna like this, a man could wrestle a bear and win!" History of the Finnish Sauna, Mihael Cankar. We hope the information on the PrimitiveWays website is both instructional and enjoyable. Understand that no warranty or guarantee is included. We expect adults to act responsibly and children to be supervised by a responsible adult. If you use the information on this site to create your own projects or if you try techniques described on PrimitiveWays, behave in accordance with applicable laws, and think about the sustainability of natural resources. 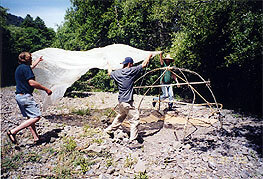 Using tools or techniques described on PrimitiveWays can be dangerous with exposure to heavy, sharp or pointed objects, fire, stone tools and hazards present in outdoor settings. Without proper care and caution, or if done incorrectly, there is a risk of property damage, personal injury or even death. So, be advised: Anyone using any information provided on the PrimitiveWays website assumes responsibility for using proper care and caution to protect property, the life, health and safety of himself or herself and all others. He or she expressly assumes all risk of harm or damage to all persons or property proximately caused by the use of this information.